One of my most favourite environments is the traditional ryad in Morocco. One of THE loveliest hotels I’ve ever stayed in was in Marrakech. I especially like the internal courtyard, with a fountain, and in the one where I stayed, there were orange trees growing there. Every late afternoon, traditional musicians would sit and play in the courtyard and we’d drink mint tea while relaxing in the alcoves. Here’s my vote for re-learning what those medieval hospitals got right! Too often “progress” and “modernity” means rubbishing the past and losing so much valuable knowledge. Imagine how health care could be transformed by this kind of attention to both the environment and the arts, and not reducing our focus to a materialistic concept of the body. I got thinking about sensations the other day. Patients talk to me every day about their sensations – pain, dizziness, nausea, itch, numbness and so on. The medical concept of such sensations is “symptoms”. Interestingly, not a single one of these symptoms are objective. Nobody can know them, experience them or measure them apart from the person who has them. But what are they? According to psychologists, sensations are the effects of sensory stimuli, and perceptions are our awareness, or understanding of them. So, are sensations in the mind? Well, that’s not where we tend to situate them. We situate them in the body. Pain is usually described as being felt in particular parts of the body. Pain in the leg, an itchy arm, a numb patch on the back of the hand….and so on. That suggests sensations are in the body, not the mind. But what about phantom limb pain? A sensation which is specifically located in a part of the body which no longer exists? Where do doctors look for a problem when someone describes a sensation? The part of the body the sensation “belongs to”. If someone has chest pain, doctors go looking at the chest and its contents for an explanation of the pain. If they can’t find any abnormalities there, then the focus shifts to the mind – “it’s not in his chest, it’s in his head”. In other words, in the absence of physical pathology in that part of the body, the explanation given is a disorder of the mind. Do you find this an adequate understanding? It seems to me that sensations are phenomena of the person, and shouldn’t be attributed to either the body or the mind. They should be situated in a person’s story, because it’s the narratives we tell ourselves and others which create not only a sense of self, but all of our sensations too. Sensations may have locality, but that doesn’t make them the markers of pathology. They can be the expressions of meaning. If you’re not sure what I’m on about here, check out this post. And if you’d like to read more about the idea of meanings behind sensations, you could start with the excellent “Why do People Get Ill?” or “Meaning-full Disease“. at the Tagore Festival, the Iranian Sufi scholar Hossein Ghomshei explained what he understood by the word ‘harmony’: “Harmony is the existential principle of the universe. Knowledge of universal harmony is science, expression of it is the arts, and the practice of harmony is religion. Which means there is no conflict between science, the arts and religion – all three operate within the context of the universal harmony.” The sun is in harmony with the soil and the seeds, the oceans are in harmony with the land, bees are in harmony with flowers, and the five elements harmonise and cooperate with each other to maintain life on Earth. We are all related. “Reality is not a thing, reality is relationship amongst things,” says Iain McGilchrist, author of The Master and his Emissary. Reality is reciprocity and mutuality; dark and light, below and above, left and right complement. And, in the words of E.M. Forster, all we have to do is “only connect”. Oh yes, I like this. I often think about health, and what it is, playing with words like holistic, integrative, vitality, resilience etc….but for some reason I hadn’t considered the word “harmony”. What I love about harmony is, like beauty, or wellbeing, you just know it when its there. It’s both holistic and intuitive. Harmony is also produced by the fitting together of different elements. It’s not about everything being the same, so it’s completely consistent with the “integrative” idea of a good relationship between well differentiated parts. We are such complex creatures, and the idea that healthy working together, or relating of the multiple different parts, is “harmony” is very appealing. In fact, we are embedded creatures, in constant relationship with others and with our environment. To be in “harmony” with others, with the rest of Nature, with the planet, (hey, even with the universe!) strikes me as an excellent goal. So, is my Life in harmony? And, how can I work towards greater harmony? On a daily basis, with each choice I make, is that choice likely to produce greater harmony? Or to produce discord? One of my favourite lines from Bob Seeger is “I wish I didn’t know now what I didn’t know then”. 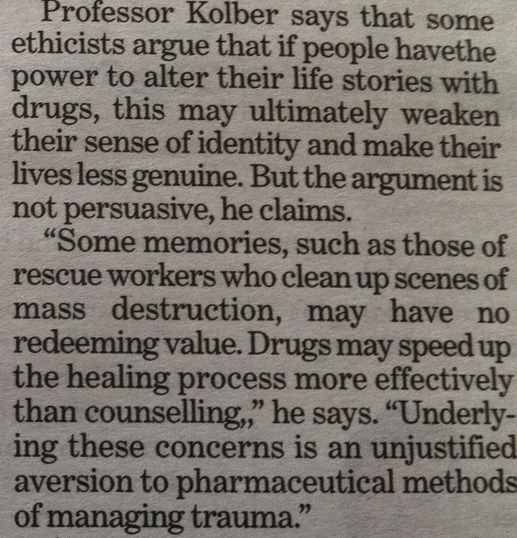 However, I was a little startled by a piece in the “i” newspaper last week about drugs which can wipe out memory. Here’s a jpeg of the bit of the article which really took me aback…. I don’t know about you, but as best I understand it our memories are a key part of the stories we tell ourselves and others to create both a sense of self, and to make sense of our lives. Who’s to say that a painful memory has no value. A painful memory will probably always be a painful memory, but our responses to painful episodes can be the important foundations of who we become. I am frequently impressed with the writings of Ray Moynihan, and his article in this week’s BMJ is probably one of his best. It’s entitled “Surrogates Under Scrutiny” – not a title which immediately appealed to me because I mistakenly thought it would be an article about surrogate pregnancy. I was wrong! It refers to use of “surrogate” markers for health outcomes. I must confess I’ve never come across this use of the term before, but he relates it to The Institute Of Medicine’s report “Evaluation of Biomarkers and Surrogate Endpoints in Chronic Disease“. It’s a constant source of frustration to me that the reductionist, materialistic promotion of “evidence” in Medicine, seems to prioritise biomarkers, and to trivialise patient centred outcomes, or any attempt to capture the narratives of health and wellbeing. I now understand more clearly why. It’s also a source of concern for me that human beings are consuming ever greater quantities of pharmaceuticals without any evidence that is producing greater health, wellbeing or happiness. Don’t get me wrong. Drugs can produce great changes in disease and, consequently, can open the opportunities for people to thrive, grow and experience better health. I wouldn’t like to see diabetics trying to get by without insulin for example. However, the limited view that only drugs can produce better health, strikes me as fundamentally naive. In fact, in many situations, the balance between potential harms and potential benefits has swung way far in the direction of harm. I now understand more clearly why we’re getting this wrong. Let me just replicate for you here the closing paragraphs of Ray Moynihan’s article, because I don’t think I could put it better myself. A major rethink of the role of surrogates in medicine is timely. Routinely approving and prescribing therapies on the basis of their effects on someone’s numbers, rather than their health, is increasingly seen as irresponsible and dangerous. And even when evidence suggests clinical benefits of popular “preventive” medicines for those at lower risks, a rational assessment reveals many people must be treated to prevent one adverse event, so most users gain no direct benefit despite years of treatment. The cost effectiveness of this approach is unsurprisingly in doubt. More disturbing still are the questions about whether some of the suggested clinical benefits are real or simply artefacts of sponsorship bias. The rigour of the evidence informed approach to medicine has in recent decades helped us all understand the limitations of relying on surrogates, and for one of its key architects—McMaster University professor Gordon Guyatt—this problem is both historical and cultural. He argues that central to putting American medicine on a scientific basis was the assumption that an understanding of biological mechanisms would translate into improved management of patients. And while medical students over a century later are still taught to focus on fixing a person’s biological numbers—whether it’s cholesterol or bone density—what is urgently required is a new approach that provides genuine improvement for the person. Understanding biological mechanisms and diagnosing by numbers has undoubtedly brought great benefits. Yet as the definitions of medical conditions relentlessly expand via that porous relationship between the science and business of healthcare, this fragmented reductionist approach is conferring multiple medical labels on vast swathes of healthy people, who are then treated with preventive drugs that won’t help most of them and may hurt many. The magic of numbers may help corporate profits and professional pride, but at what cost to the health of ordinary people who mistake a numerical benefit for a genuine one? Surely it’s time to ask if there might be a healthier new model for medicine based on far less harmful and costly ways to try to reduce human suffering. 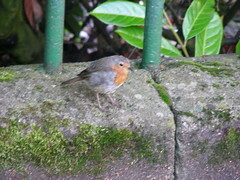 You caught my eye on my way to work…. What was it? Who was it?